In this article we will learn about casting defects its causes and remedies. Defects are common phenomenon in any engineering process. There is such limitation of any process, which causes defects. The proper designing and moulding can give a defect free cast but due to some control limitation and human interference, defects are generally occur. By the proper assistance on work we can minimize the casting defects. Generally a proper casting product also has some defects so a research is going in foundry industry to minimize these defects. These casting defects can be found out by the non destructive testing methods which includes ultrasonic testing, radiography testing, magnetic particle testing, die penetration testing etc. Today I will point out some common casting defects, its causes and remedies of it. These defects can be classified into three major categories. It is a gas hole or gas cavity which is occurs at the surface or the internal part of casting. It is due to gas interrupted into the casting due to poor ventilation. Mostly it is occur at surface which makes a circular of oval shape gas hole. These defects can be seen after machining of surface. These defect cause due to improper venting system, excessive gas or moisture contain and due to low permeability of sand and high temperature of sand. It is also due to low pouring temperature of metal. 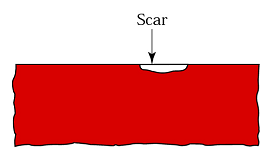 Scar is generally occur at flat surface and it is due to improper venting or permeability of sand. The blow is covered by the thin layer of metal. This is also known as slag inclusion of sand inclusion. This is look like as slag inside the cast and very difficult to remedy because generally it does not occur at single point. This defect generally occurs due to defective mould or core, low binding strength of moulding material or sand. It is also due to low permeability of sand. This defect occurs when fluidity of molten metal is high. When mould is porous and does not enough stronger to resist molten metal, this defect occur. The liquid metal penetrates the mould and mix with sand. This gives uneven casting surface. It is the basic defect which generally occurs. It is occur when the molten metal flow through two different paths. When the two stream of molten metal comes in contact and solidify before they mix completely, some bubbles form between them. 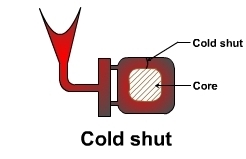 This phenomenon is known as cold shut. It is also known as cold lap. 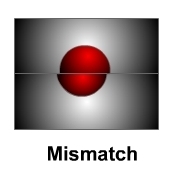 It is defect due to mismatch of cope and drag. It is also known as shift. When the cope shift relative to drag known as mold shift and when drag shift known as cope shift. 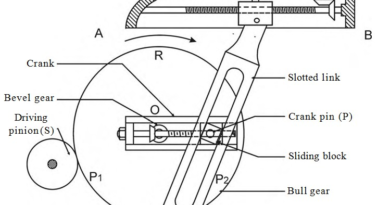 It is due to the bouncy of the molten metal, loose box pins etc. 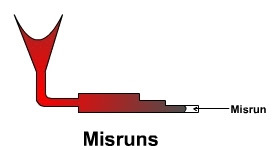 Misruns is a phenomenon when the cast materials solidify before the proper filling of mould. This result presence of incomplete cavity filling. It is due to too thin wall thickness, improper gating system, slow pouring, damaged pattern and poor fluidity of molten metal. A hot tear or crack is generally not visible because the casting has not separated into fragments. This is occurring due to uneven cooling and improper position of chills. This is generally occur where abrupt section change. 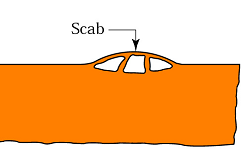 This is occur during solidification of casting when the solid portion have not sufficient strength to resist tensile force. 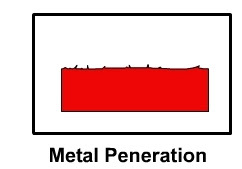 This defect generally arises during volume contraction during solidification. It is occur when the liquid metal does not sufficient to compensate the volume shrinkage. This is due to insufficient size of riser, improper direction solidification of casting, improper location of chills or in gates. 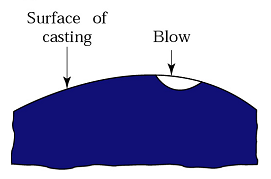 The formation of uneven line on the cast surface is known as buckle. It generate due failure of sand surface or expansion of sand surface due to heat of molten metal. Pin holes are similarly to blow holes but smaller into size. These are generally present at surface or sub surface and in large numbers. This is due to improper ventilation for gas and low permeability of moulding material. 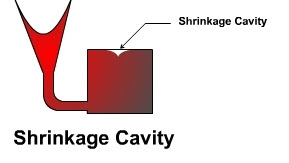 It is the defect or deformation in a casting that occur during or after solidification due to different rates of solidification of different sections of casting, so stresses are set up in adjoining walls resulting in warpage these area. This defect generated due to insufficient strength of mould when metal flow to the mould due to liquid metal pressure, the wall of the mould cavity damage. It is also due to rigidity of the pattern is insufficient then it cannot withstand with the ramming pressure and the wall of cavity damage. Today we have learnt about major casting defects and its causes. These defects can be remove by proper casting techniques. If you have any query regarding this article ask by commenting. If you like this article, don’t forget to share it on social networks. Subscribe our website for more informative articles. Thanks for reading it.